Elegance, style, full service and a stunning seafront position... a truly top range villa. Crossing the Rock incorporates everything that is desirable in a rental villa: a rare and privileged seafront position, sensational views, stylishly crafted and luxuriously proportioned interiors, extensive panoramic grounds and terraces, a large pool, discreet pampering service and total privacy: all at the heart of the picturesque fishing village of Santa Maria La Scala, with its excellent seafood restaurants, amenities and rocky-pebbly beach. ⁵ guests staying at Crossing the Rock have privileged, reduced-rate access to Belmond Villa Sant'Andrea's exclusive lido on the beach at Mazzarò. Outside: Crossing the Rock offers no end of outside space. The central sea-view terrace is perfect for dining, lounging, aperitifs or just gazing out to sea, the dining room terrace is a great spot for al fresco meals, while the series of terraces, walkways and gardens to the left of the U are home to the large pool and a canopied sea-view pergola, all ideal for soaking up the sun, relaxing or indulging in fun and games! A sea gate leads from these terraces down to the large lava stone rocks and the limpid sea beyond. The icing on the cake is that the fishing village of Santa Maria La Scala (on the doorstep of your own private oasis) offers a series of excellent seafront fish restaurants, bars and lidos with bathing platforms. Service: Crossing the Rock offers an impeccable level of service, including a member of staff who will prepare breakfast, and a maid who will carry out daily cleaning. A cook is available on request. Please note that there is no real shallow end in Crossing the Rock's pool, whose minimum depth is 1.3m. Guests staying at Crossing the Rock have privileged, reduced-rate access to Belmond Villa Sant'Andrea's exclusive lido on the beach at Mazzarò. If there are more than 10 in your group, why not book Crossing Together, which includes Casa alla Scala, a beautifully appointed apartment sleeping six below Crossing the Rock? 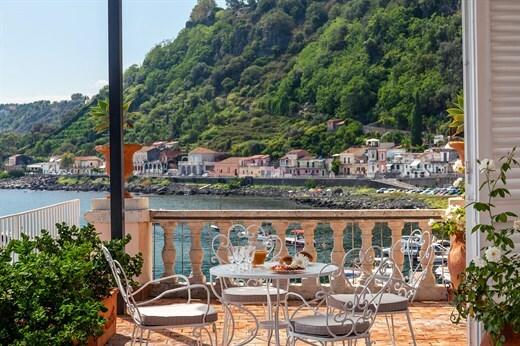 Santa Maria La Scala, on the sea below Acireale, is a characterful working fishing village, still relatively untouched by tourism except during August and summer weekends when it attracts locals from Catania in search of the sea. Its harbour (where you can hire a boat), sea-front fish restaurants, bar and bathing platforms are on Crossing the Rock's doorstep. "Crossing the Rock exceeded all of our expectations. Although all of the pictures of the villa were beautiful, the property in person was almost overwhelming." The setting of Crossing is sensational. The staff were brilliant. I can honestly say that the experience exceeded our high expectations and was exemplary. Fantastic. The food, the service and the people at Crossing the Rock were all exceptional. Crossing the Rock was fantastic in every way. The overall experience was top notch from start to end - we have incredible memories of the beautiful location, the people, the history, and of course the amazing food and wine. We are very thankful to all the members of The Thinking Traveller team who contributed to an amazing vacation in Sicily. The in-villa cooks were superb and wonderful to interact with - we very much enjoyed our 5 dinners and always looked forward to seeing what was on the menu. Having breakfast and coffee prepared each morning overlooking the beautiful view was a very special touch. Crossing the Rock was an amazing experience. The villa was beautiful and the setting priceless. Being situated in the heart of a Sicilian fishing village lent a special flavour to our whole experience. The staff were very accommodating and pleasant. In villa wine delivery: great to have some wine already there on arrival. Lovely tasting and very reasonable. In villa cook - see above. Definitely one of the highlights of the holiday. We loved the villa so much I just wanted to stay at home and enjoy it. What we most enjoyed about our holiday? The peace and serenity of the villa. The surprise was that the actual home you rent never looks as good in real life, this home EXCEEDED ALL EXPECTATIONS!! The staff were excellent. The in-villa breakfast was excellent and we used the cook for 3 nights; excellent food and very professional table service. We loved Crossing the Rock. We loved its location by the sea, the sea view, the fish restaurants nearby, the central situation of the villa on the East Coast of Sicily... the staff was very kind and helpful. The cook on New Year's Eve was expensive but everything was perfect and we had a great evening. We absolutely loved the outdoor areas and thought the setting, grounds and views were outstanding--as were the staff. We spent most of our time outside on the lovely terraces so we totally enjoyed the experience and the villa. Crossing the Rock was amazing...beautiful and very well-kept. We loved the peacefulness and beauty of the property. The staff was exceptional and very helpful. The breakfast service was such a huge treat. The dinners at home were spectacular! The villa far exceeded expectations; the setting was authentic; very little English was spoken by the restaurants which actually made it more fun; the whistles of the produce sellers each morning; the colourfulness of the people living and working all around us was a joy. We enjoyed everything. All was very good at Crossing the Rock. Wine delivery, cook were all excellent. I am not being lazy by giving you 5s for everything. Crossing the Rock, the staff, the experience - everything was fantastic. I loved every minute. You exceeded my expectations on every level. It was one of the best holidays I have ever had and I have had some spectacular ones. Crossing the Rock exceeded all of our expectations. Although all of the pictures of the villa were beautiful, the property in person was almost overwhelming. Your website was extremely informative and professional. The in-villa cook was excellent, along with the dinner service and presentation. We thoroughly enjoyed spending time with our family at Crossing the Rock. The location was spectacular, the views were magnificent, the cooks, cleaning ladies, grounds keepers and help were so lovely and they made our trip, the Trip of a Lifetime. Without them our tip would have never been the same. The breakfast cook was incredible and our dinners were all excellent and so much fun to plan! We never ate dinner out. The villa was lovely, staff very good and the chef was amazing. We had a wonderful stay. The villa a delight and we would recommend having the chef and driver. Crossing Together (Crossing the Rock and Casa alla Scala) provided the perfect setting and amenities for our family of 12 (7 adults and 5 children). The villa is well appointed and the grounds are beautiful. All of the bedrooms and baths were comfortable and nicely furnished. The owners have attended to every detail. It is difficult to imagine a finer villa in all of Sicily. The staff adds an element of luxury and convenience. We used the cook for all 7 evening meals and this was a true Sicilian dining experience with a master chef whose charm and gracious manner made every evening an experience. The daily service was an added bonus and made stay delightful. The caretakers were charming, friendly, and caring. The town was delightful and the villa position presented a setting for beautiful evening gatherings. In my opinion, the reviews which I had read understated the beauty and charm of this villa. It was extraordinary. Adults and children enjoyed the entire experience. Everything was incredible. We cannot believe how wonderful it was to have such a beautiful place to use as a home-base and also to relax at on the days we weren't sightseeing. Overall the staff was extremely helpful and professional. Of course the language barrier was a bit tricky but we managed! We LOVED having the cook and waiter service - was one of the highlights of the entire trip! Honestly, i would book a trip ANYWHERE in the world with your expertise with no hesitation. If you had a villa in a place we were looking to go, it would be a no-brainer. We were blown away by our experience from start to end. Without question, this was our favorite family vacation to date! The villa itself was the highlight of our visit. The sea location was a paradise. The entire staff was excellent. The cook was outstanding and her meals were exceptional. Very enjoyable all around. The staff was excellent and very helpful, as well as flexible. The entire family enjoyed the experience and the home. All the staff was doing a great job and they were welcoming us with their Italian affection. I would especially like to stress that we very much enjoyed the delicacies prepared by our cook - excellent! We enjoyed our holiday very much and would like to book another. Hi Rosanna & all the team at Think Sicily, I just wanted to let you know we had a fabulous week at Crossing the Rock. Sometimes you see a place to stay and it has a few disappointments when you arrive, but Crossing the Rock met all our expectations and more. The staff at the villa were delightful and accommodating. I would certainly be happy to refer Think Sicily to friends in the future. It was a wonderful time and if we ever come back to Sicily I would not hesitate in using your company again. This place was absolutely incredible. It was perfect for the point in time in our long vacation. We enjoyed every outdoor area, our son loved the pool and the playground, the house manager (Antonella) was incredibly gracious and helpful, and the maid, the groundskeeper, and the chef (and waiter) were a joy to be around. We will definitely be back to this place. The fishing village was picturesque and entertaining to watch the card games in the evening. We had the best homemade Limoncello at Scala Grande as well. Beautiful house and excellent service. The house manager was very helpful and the housekeeper was delightful. An outstanding villa in every respect. The staff, particularly Antonella, exceeded our expectations. Cook and waiter were superb... Another excellent holiday with The Thinking Traveller. Coming from a family of world travelers, we are very critical of our vacations. Our holiday was above and beyond perfection. There are no words to describe the level of service, location, and villa. The villa grounds are absolutely stunning, and we loved being in a small town away from the busy tourists. The only problem was that we didn't have enough time. We are already planning our next trip back to Crossing the Rock. Antonella, the house manager, was absoutely exceptional. Her services were of a 5 star hotel and beyond. With all of our travels we have never experienced customer service better than hers. While the villa was stunning, her services would be what would bring us back for a 2nd vacation at Crossing the Rock. Our cook Rosamaria was also fantastic! Her food and charm made her a delight to see every day. The house is a palace, it is even better than in the website. Antonella, the house manager, has been really helpful and willing to make anything to make our stay perfect. Eveything the chef prepared was delicious and she was very friendly. Santos and his family were also beyond helpful and friendly. The whole staff was first class service. If there is only one thing to criticise is that the bathroom in the main bedroom doesnt have a shower. We had a great time very peaceful... everything was what we expected... Great food good wine... We loved our cook !!! The pastas were unbelievable and the assortment of fish dishes were great! We are really glad we decided to have her make 7 dinners... The helpers, housekeeper and the person who took our luggage and other things were very good as well. We absolutely loved our time at Crossing the Rock. From the first moment we walked in we knew it was going to be a perfect destination for our family holiday. We were met by the owner and local manager and made to feel immediately 'at home'. Both were very gracious and made us feel welcome... It was just the perfect holiday. We were utterly spoilt by everyone and were all very sad to leave. The staff at the house were delightful and the owners the most gracious of hosts. Crossing is a jewel in the, already, sparkling 'Think Sicily' crown!... We enjoyed being in a place that was unspoilt and that was accessible to other stunning parts of Sicily... You are a very efficient organisation and one of the best companies to deal with. Thank you. We had a truly amazing week at the villa and I thought that Santa Maria La Scala, Acireale and the home were all entirely charming. The villa and its location is incredible. We loved the fishing village - very authentic - I even bought fresh fish directly from the local fisherman at the port for our last dinner. Please pass on my compliments to the owners for having such impeccable taste. It really is a jewel. The villa is more like a palace and the views are unbeatable. Even with the dreadful weather we had, the views were still dramatic. Although on the pricey side it's well worth the money - we were treated like royalty. Our concierge, Francesco, was fantastic. Nothing was too much trouble. The 4x4 Etna trip is great - although scary!! We also had a guide give us a whirlwind tour of Catania before we went to the airport (organised by Francesco, our concierge and Ornella) and that was very enjoyable. All the Think Sicily staff have been nothing but helpful from start to finish. We have already sang your praises to various friends and family!